So A-Kon is come and gone, and now so is SoonerCon. I had an absolute blast at both, but I was the organizer for SoonerCon. Our "Learn to play D&D campaign went very well, and I got reports from local gaming stores of new people coming to their FLGS (Friendly Local Gaming Store) to play D&D, and board games. Most of that groundwork was done by volunteers, so I want to take a minute for them. There are soooo many people to thank, but I am going to try. Thanks to my wonderful partner for keeping me together! Thanks to the DMs that helped! Marcus, Amanda, Doug, Denis, Joe, Matt C., Matt H., Amber, Kyle, Bryan, Chris, Peter, Robert, Jill, Chase and Anthony. Without you there would have been no games! Next, a thank you to Lilie, Julie, Amber, Harrison and Austin for helping me keep the front table afloat. Without you, the players would have been lost! 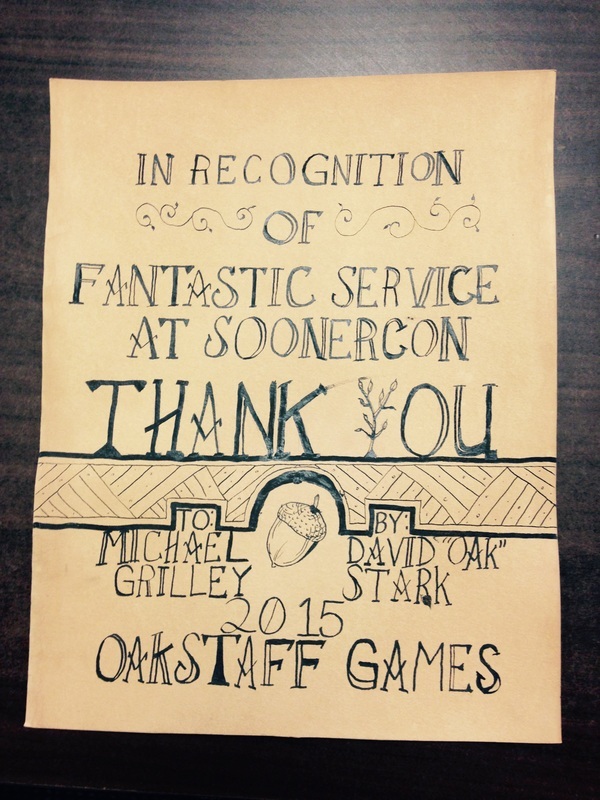 A giant thanks to the entire SoonerCon Committee. You guys rock! One of the most professional Cons I've been to, and you are the reason. Shout out to Aislinn, Phil, and Bill for checking with me to make sure I had what I needed, and that the Game room had what it needed. 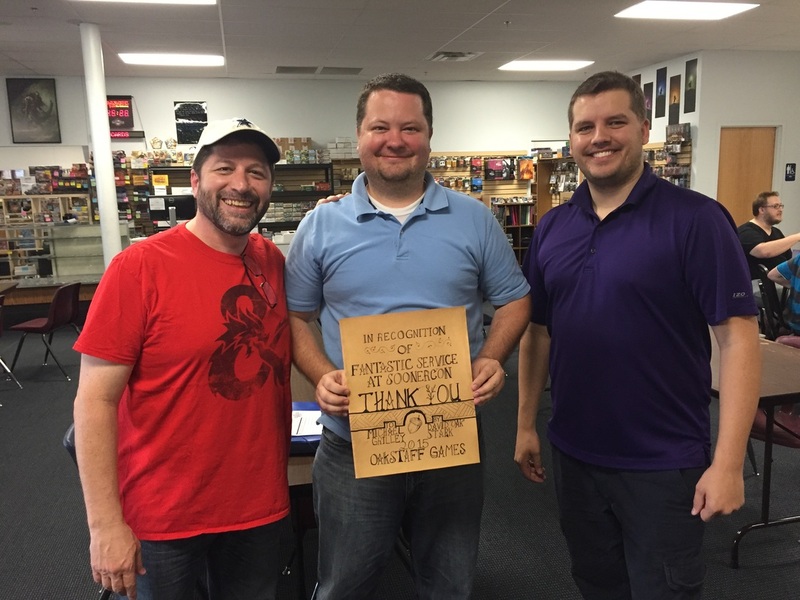 Above: Robert Alaniz, Michael Grilley, and David "Oak" Stark when delivering Michael his thank you at the FLGS Michael and Robert play at. Right: Close up of Scroll made by Oak for Michael. I also was a panelist for a couple topics alongside several other great panelists. Casey, Brian, James, and Greg were awesome, and it was a pleasure to see and explore their ideas and experience in the gaming production world, since it is so different than my own. And we are not even finished yet! I have just brought on an additional artist for NPC Tuesdays. In the coming weeks you can expect more NPCs, More artwork, and More Plot Hooks for playing or creating your own game. Check out our new ARTISTS Page to see bios of those folks. 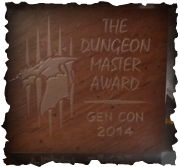 Coming soon is GenCon! The largest Con of the year for folks like us, and I'm headed down with some great people this year. Gamers I've known for years, as well as a couple good friends who aren't gamers, but wanna see what the fuss is about. I am also meeting several people I haven't seen in years while I'm there. It's gonna be a hoot. To top this all off, I have a stack of new playtest materials, and a list of Kickstarters to review. I have several pages of Building Character, and I've started on a Novel. I can't tell you much about that yet, because it's... well.. a secret. Suffice it to say, 2015 has been one of the busiest years of my life, and it only seems to be getting busier. So I gotta keep going, or risk slamming my face into the ground. Thanks for reading, without each of you, I would have no website, and no one to share my rollercoaster ride of Fantasy and Fun with! Applewood is facing trying times. Shudders in the earth have lead to the belief that the gods are angry. Raids have increased, and the town guard is watchful through the night. Passage to and from Windbreak is unimpeded though, and several heroes have shown up to assist! Astride a sea vessel comes a group of heroes answering the call for aide. Will this rag-tag group of adventurers become heroes? Or will the melt away into oblivion as Applewood's orchards burn, her walls crumble, and her dead people left to the mercy of vultures? Answer the call to defend Phlan! On Jan 10th, 2015, Phlan will come under attack! We will be hosting a fundraiser to purchase new tables, chairs, and other equipment for our play space at Game HQ. Windbreak is the nearest city to Applewood. Many of the farmed crops from Applewood are sold in Windbreak, as well as manufactured goods shipped and sold in town. For example, many textiles are made in Applewood, as well as many Ciders and apple based products. The reason is simple, there simply isn't enough room for Sheep and an Orchard inside the massive city walls of Windbreak. Those that live inside it's walls do so under the command of the City's ruler and the Council. Prince Trenton and Princess Abaster rule while their father, King Berigan gets better. He has been ill for many years, and they have had to stand up and take the reign. The Council is a group of Noblemen that the King named. Noble men and women who harbor no ill will towards the kind. Many noblemen were insulted by not being chosen to serve, but none such that fighting has occurred as a result. The city lives in peace with over 200,000 inhabitants. Windbreak is a true trade town. It makes very few of it's exports, and brings in a lot of trade by way of the road, and by sea. Since the Prince and Princess have taken over at such a young age, the city has lived in prosperity. Interestingly, since the children took over, many shop keeps and dock workers showed their support and began hiring children. Children under the age of 18 often make up a majority of the for-hire labor in the city. Carriages, Lightrunners, Dockworkers, and Newspaper runners are primarily children. Prince Trenton and Princess Abaster have no mother, as she died during childbirth of their youngest sister, who sadly, did not survive. Windbreak has beautiful high walls, with towers that give a grand view of prairies and ocean alike. Dotting the landscape are Orchards, Farmlands, and towns of varied sizes. It is said that you can see for miles from the top of the towers, and nearly as far from the top of the wall. Many sages call the towers home. Crime is low in the city, and in fact, 'tis a traveler's paradise since pickpockets are almost unheard of. Many bands of traveling merchants have made Windbreak their primary stop, coming to trade and to refill their wares. Many specialists come here for the unique products gathered for sale here. Often, they find themselves unwilling to leave the abundant supply. Wizards come for the wide variety of materials used in their casting. Smiths come for the salts and fine metals traded here. Adventurers often make their home here, sharing their wealth with the city by purchasing their gear and paying taxes. The army is surprisingly small in Windbreak. The people of the city largely police themselves. It is more likely for a citizen to step in and stop a crime than it is that they will call for the guard. Responsibility for their home is often their highest concern. This is accompanies by the fact that there are other measures in place should the need be dire. The Captains of the ships that call Windbreak home, are all contracted to serve as a Navy should the city need it. The adventurers that live in the city get a significant cut in their taxes should they agree to contract. This leads to a type of National Guard when disaster strikes. The City is able to muster 50,000 soldiers in about 3 days. This is comprised of skilled workers, hunters, and smiths in addition to the adventurers, sailors, and town guard. No force has ever invaded Windbreak and succeeded. The city venerates a god(dess) of luck and trade. A large temple stands in the center of town, it's wide courtyard open from the outside, serves as the trade square. The temple itself is a massive inn, and home to several of the guilds. Men and women are treated equally, as well as people from all races and walks of life. Very little fear is held here, since the sense of community is so strong. In fact, there is a story of an Ogre walking into town, seemingly lost. An adventurer came and spoke to it, and helped it find its way home. Another story tells of a group of vagabonds that came to make trouble. One of the wizards from the tower appeared before them and left them with a clear warning: If you cause trouble here, I will know, and I will make you pay. The vagabonds did not stay longer than an hour, and caused no trouble while there. The last major threat to Windbreak was a dragon who became jealous of the loyalty that King Barigan held. She appeared and demanded tribute, lest she burn the city to the ground. Within minutes, the people of the city had armed themselves and marched out the front gates. Thousands of men, women, and children came with projectiles. Slingshots, darts, javelins, and rocks. The town guard and more than a dozen wizards came out to help, waiting for command from the king, and watched as the flustered dragon became more and more annoyed. As more townsfolk emerged, armed, King Barigan appeared on the walls with a group of adventurers. He laughed at the dragon, and invited it in for Tea. The dragon did not know how to respond to this hospitality, and turned into a fair elven lady. The story goes that she was so impressed with the king, that she joined him for Tea, and stayed as a resident. No one is sure who she is though, the noble woman in disguise. Windbreak helps the island citizens, and townsfolk that live near it's borders and remain loyal to King Barigan. The Town Guard often patrols the roads and areas near the city, even aiding nearby towns in times of danger or turmoil. The beacon of the Southern continent, Windbreak is a true wonder of the world. Applewood is a project that I hold very dear to my heart. My NPC Teusday events, and many of my Dun Dun Dungeon events will be located in Applewood. As you read through these entries, try to see where they fit in for YOUR world. If you want to use Applewood, go ahead! Just realize that Applewood is a placeholder for me as a writer. For example. In Hershal's Haunted House, I introduce Hershal as the son of Gregorian. I also describe them as Gnomes. This works well if you are in Dungeons and Dragons, but less so if you are running a White Wolf campaign. CHANGE IT. Rename them, put them in YOUR town. Make them Humans, or describe them as short and overly happy for no good reason. The most important thing about Applewood is it is a SPRINGBOARD. Launch yourself forward. Use those pointy plot hooks, and Stock up on NPCs every Tuesday for your game. And if you need help with one or more NPCs for your game, Use the CONTACT OAK Page!